I'm working on turning out faster pages, but it's hard to make them fast and keep the fun details in. I tore the red cardstock at the top and inserted some red Magic Mesh. I was going to "dangle" the title from the mesh using some wire or floss, but for the sake of time, I printed the title on my pc then mounted it with pop dots. It looks cute enough. 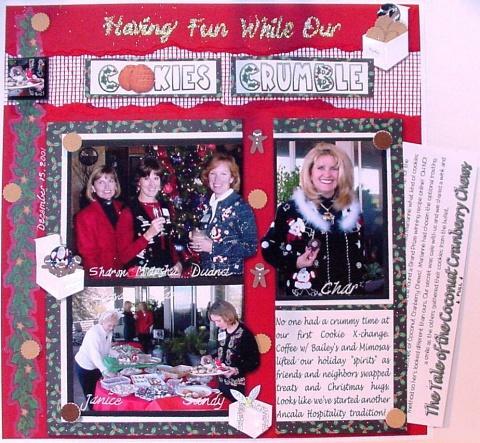 The photos were cropped leaving the elbows sticking out then mounted onto cardstock and printed paper using Jolee's cookie mounting corners. I used white gel pen to write the names of the gals right onto the photos. A sticker border of holly was added to the left side, I wrote "Having Fun While Our" with my glue pen then sprinkled glitter onto it, and added a few more Jolee's cookie embellishments. There was a very funny tale of one of our cookie recipes and not enough room on the page for everything, so I printed up the story entitled "The Tale of the Coconut Cranberry Chews" on one side of cardstock and the actual recipe on the other side, then created a "pocket" behind the photo and journaling on the right and slipped the cardstock into the pocket. I love it when the viewer has to "interact" with the layout. For this one, all you need to do is pull out the card to get the hilarious account of a very popular cookie recipe! Yummy results!